Inspired by the south of France. Infused with California soul. Showcasing breathtaking views, Auberge du Soleil is the dream of French restaurateur, Claude Rouas. In 1981, with business partner, Bob Harmon, Rouas opened Napa Valley’s first fine-dining restaurant, designed to reflect a taste of Provence in California wine country. The immediate success prompted the addition of “The Inn of the Sun” five years later. Nestled within a terraced, sun-kissed hillside amid 33-acres of heritage olive and oak trees, the hotel’s 50 contemporary guestrooms and suites, effortlessly blend relaxed sophistication with understated elegance, earning a long-standing reputation as wine country’s most iconic luxury property. Exceptionally drinkable and hard to put down. Rosé. It's Summer-in-a-Glass and it will be inescapable at Auberge du Soleil throughout the month of May, from the moment you arrive until we bid you "adieu." Breakfast on the terrace overlooking the valley. An excursion thru the vineyards. A taste of this. A swirl of that. A leisurely afternoon nap at the pool before another delicious dinner. Such is life in Napa Valley. Indulge this summer at Auberge du Soleil. Auberge du Soleil is partnering with ERDA, Napa’s ultra-premium organic tea farm, to provide a signature wellness tea blend available exclusively for guests of the award-winning Auberge du Soleil Spa. Selected for their cleansing and clarity-promoting properties, the blend features lemon verbena and spearmint. 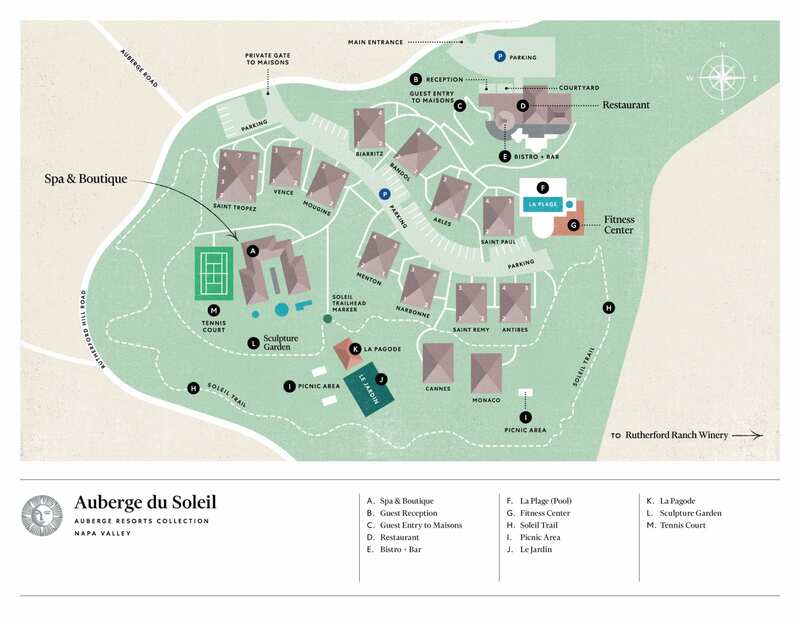 The Auberge du Soleil + ERDA Spa Tea is now being served at the conclusion of all spa services to enhance the wellness benefits of each treatment in conjunction with the restorative culture of tea while guests linger and relax in the spa’s tranquil, picturesque setting. Renowned for its culinary roots, spectacular views and exceptional service, Auberge du Soleil is dedicated to ensuring each guest experience is unique. Enduring relationships with vintners and restaurateurs throughout the valley allow for exclusive access to some of the most sought-after - and little known - tours, tastings and dining experiences in wine country. Highly recommend. The Auberge offers large suites with outdoor showers and bathtubs. The views are beautiful, and yet, the Auberge still offers a boutique and unique ambience for Napa. Great for honeymoons and anniversaries. 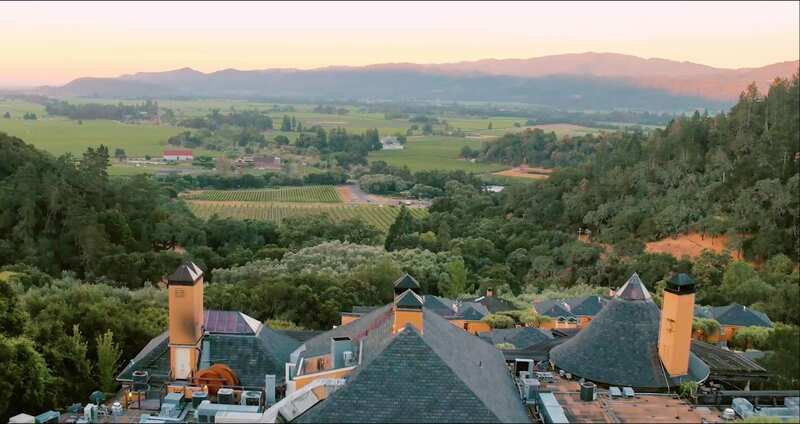 Wellness seekers have another reason to visit the Auberge du Soleil Spa in Napa Valley. In addition to the spectacular views, zen-like atmosphere and exceptional services, spa guests may now enjoy a signature wellness tea as part of their spa experience. Developed by ERDA, Napa’s ultra-premium organic tea farm, the custom blend features lemon verbena and spearmint, selected for the cleansing and clarity-promoting properties of the herbs. The Auberge du Soleil + ERDA Spa Tea is served at the conclusion of all services to enhance the wellness benefits of each treatment while guests linger and relax within the natural beauty of the Spa Courtyard overlooking the verdant vineyards and Mount Veeder in the distance. Auberge du Soleil has long been renowned for its legendary views of picturesque vineyards on the valley floor anchored by majestic mountain vistas in the distance. This natural beauty is exclusively accessible for guests of the hotel in a more up-close and personal form via the property’s expansive gardens and nature paths, which, over the years, have undergone an extensive transformation. If there’s a more impressive way to commence a celebration, we’ve yet to find it. Sabering a bottle of champagne instantly turns any gathering into a fête, initiating a cause for serious revelry and merrymaking. You are the best around!